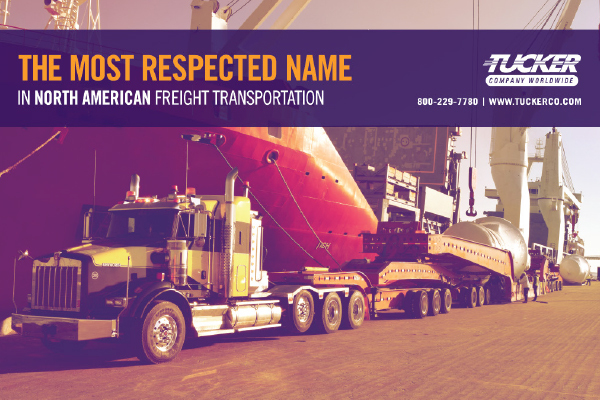 We are Tucker Company Worldwide – the most respected name in North American freight transportation. We are passionate about our business, our customers, carriers and our industry. Oversized, delicate, high value, hazardous… each of these freight types is wildly different, but they have one thing in common: all require the utmost care, and must be handled by competent professionals and carefully designed procedures. We’ve spent 56 years perfecting our recipe: a combination of ISO 9001:2015 certified industry leading processes, a meticulous approach to carrier selection, and a dedicated staff made up of freight experts and forward thinkers. We’re pioneering a new level of transportation service—again. Tucker provides outstanding service in every area of logistics planning, execution and reporting. We serve shippers from small shops, to multinational household names. We have a lot of experience moving freight, so naturally we’ve evolved to offer programs that go beyond executing simple shipments. For instance, we can coordinate a fleet of highly time-sensitive shipments – and deliver them in exactly the order you need them. We can take the lead on your project launch and arrange all major retail deliveries across the country, so that your brand doesn’t miss a beat. Tucker Company Worldwide delivers unparalleled service, around the clock.